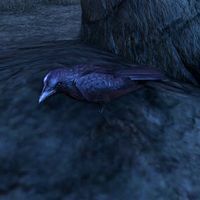 The Blackfeather Court is a feudal court of Daedra[UOL 1] in the shape of talking crows that rules over Crow's Wood, and other parts of the Evergloam. They were hatched by a Nether-Niece of Nocturnal called the Crow Mother, whom they served. The Court is locked in a constant state of war with the wolves and giant bats that inhabit Crow's Wood. The crows charge a toll on visitors to the realm, but are seldom taken seriously. Some time in the Second Era, a Dunmer member of the Mages Guild named Rulantaril Oran came to the Crow's Wood in search of forgotten spells. He did this by creating an enchanted chest to open a portal to the realm, which he hid in a small cave near the city of Davon's Watch in Morrowind. By striking a deal with the Crow Mother, Rulantaril came to the Court as a student and learned the secret magic of the crows. In return, he was to stay by the Crow Mother's side. Seeking to fool her, Rulantaril locked the Crow Mother within her tower, but ended up trapped inside with her because of the deal. His son, Telbaril, entered the realm in search of his father in 2E 582. Groups of adventurers, enticed by the chest, began to enter the Crow's Wood as well. The Blackfeather Court charged these adventurers tolls of flesh and silver, demanding to be brought silver trinkets or the corpses of dead bats to devour. The adventurers were then given citizenship of the Court, along with vassal servants. The crows helped in Telbaril's search for his father, but it is unknown if Rulantaril or the Crow Mother survived the ensuing hunt. When portals to the Clockwork City were opened from Evergloam by Nocturnal around 2E 583, the Blackfeather Court entered Sotha Sil's realm. There they stole the Skeleton Key from a Clockwork Apostle, who in turn had stolen it from Sotha Sil. The Court hid the key, but later helped the Soulless One recover it after they chased away the rivaling Exarchs of Dross crows. This page was last modified on 4 February 2019, at 07:59.